If you’re looking to make a connection to share the good news of Jesus, this is a great opportunity to invite your friends or neighbors out and for them to meet other Christians! All playing levels 16 years old and up (seniors too!) are welcome. Please bring non-marking shoes (running shoes preferred). If you have any questions, please contact John Rickey (Table Tennis Coordinator), Mark Hobe, or Pastor Noel. If you’re looking to make a connection to share the good news of Jesus, this is a great opportunity to invite your friends or neighbors out and for them to meet other Christians! All playing levels 16 years old and up (seniors too!) are welcome. Please bring non-marking shoes (running shoes preferred). 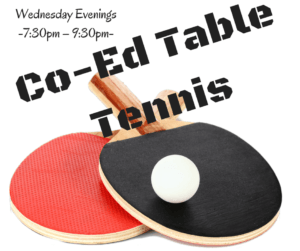 If you have any questions, please contact John Rickey (Table Tennis Coordinator), Mark Hobe, or Pastor Noel.